A question of Genre: What is the difference between a horror film and a psychological/suspense thriller? I wrote this nearly incomprehensible rant a week or so ago in response to a question asked by TBeane on Rottentomatoes, who also is creator contributor or The Armchair director. I can’t say why, but genre is endlessly fascinating to me, and I’m always tryig to understand conventions of my favourites. I want to know what makes a noir a noir and what ingredients are needed when creating a western. Genre films sometimes get a bad rap, because they rely on the same story, ideas and stereotypes time and time again. If anything, I think this is the source of their sophistication as our response to these films is measured by our pre-exististing notions of what they include, and how a new filmmaker approaches these ideas and/or re-invents them. Feel free to try and answer the question yourself, or weigh in on genre in general. Unfortunately, my thoughts so far are fairly unorganized and not particularly clear. I’m writing my way through the thought process. Going back a question, I think the fundamental difference between a thriller and a horror film is the presence (or at least) focus on a monster. By monster, I’m not necessarily meaning something supernatural like a vampire, or even Frankenstein, but also human “monsters” like Norman Bates, or John Gray from The Body Snatcher. It’s really these human variations that make the distinction so difficult to make at times, and why the debate over whether films like The Silence of the Lambs should be classified as a thriller or a horror so problematic. I think this film also becomes so difficult to really properly categorize, because it deconstructs the conventions of both genres (although especially horror). Especially in Hannibal Lecter’s character, we have, traditionally speaking, the perfect “monster”. He is vicious, nearly unstoppable, destroys (and consumes) the human form and is still very appealing. He plays a double role, however, and also becomes a Dr. Frankenstein of sorts as he is the source of knowledge. Probably the oldest horror narrative in film is science based, where there is an “expert” character who has added insight into existence, or like Dr. Frankenstein pushes the limits of knowledge beyond what it should go. Lecter is (one) of the film’s monsters, but simultaneously serves as it’s expert. What further complicated things is the presence of Buffalo Bill, who is perhaps equally as monstrous as Lecter. Can a horror film have 2 monsters? I think perhaps the most important question in determining the difference, is to ask which character is more important, Clarice or Lecter? Is it about her journey, or his psyche? I think ultimately, whichever you believe is more crucial will determine if it fits in category A or B. Still, it’s up for debate. I once had a teacher try to explain to us how to determine the protagonist of a novel, because technically a novel is only really supposed to have one. There are several books or novels that complicate the issue, and the question was raised about The Great Gatsby. Which character could you NOT remove without completely compromising the story. Is it Nick, or Gatsby? Are they both protagonists? This complication makes a film like The Silence of the Lambs ambiguous, and consistently exciting analytically in my esteem. I’d also argue that horror films, are more focused on discovery and the unknown. Beyond just being a mystery, it invokes unanswerable questions. A thriller, by definition, is less about the unknown and discovery and more focused on “dealing” with some knowledge. For example, Hitchcock’s Shadow of a Doubt I’d classify as a psychological thriller. The film’s suspense comes from Young Charlie’s suspicion and eventual knowledge that her uncle is a murderer. There is little mystery to the film, there is a brief interlude where she acts on her suspicion and tries to find the truth, but the real focus of the film is her reactions and actions in relation to knowledge rather than the search for it. A psychological thriller, is far less focused on the monster or menace but more on a protagonists’ experiences in an unusual or stressful situation that usually invokes a moral dilemma. Shadow of a Doubt, unlike a horror film, is not focused on the monstrosity of Uncle Charlie per say. It’s crucial, but not nearly as important as his niece’s reactions and presence. He is also afforded far more humanity than one would come to expect from a horror monster. 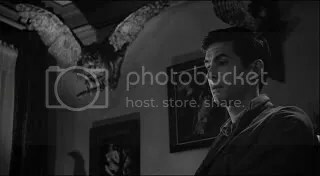 Since we’re on the topic of Hitchcock, let’s see how Psycho fits in my description of the horror genre. First, the presence of a monster. We can begin by asking, who is the most important character of the film? I think the answer is quite obviously Norman Bates. The audience is falsely led to believe that Marion Crane is the story’s “guide” and most essential character, but being killed off so quickly it’s clear that she isn’t. Our sympathy is shifted to Bates (although it’s hardly necessary to sympathise with your protagonist or monster), and as the rest of the film unfolds we realise it’s a story of his abnormal psychology and monstrosity more than anything else. The film is set up as a sort of psychological thriller, driven by Crane’s dilemma relating to her crime but the unknown strikes and normality is disrupted. The film is not about Crane’s moral or psychological dilemma or evolution, but rather an invocation of the unexplainable. I think this is why to so many, the psychiatrist’s explanation is so disturbing. It attempts to rationalize something that has been presented as so wholly irrational. Only if taken ironically does this sequence ever really work, as the traditional role of the expert attempts to explain something so abnormal so neatly. If taken seriously, it’s just ridiculous and out of place, perhaps though this is our best hint to what Hitchcock meant when he called this is “fun” picture and perhaps it’s more of a dark comedy then we’ll ever know. With the exception of Crane, the other characters’ deaths or near-deaths are a result for truth in face of the unknown. The film might not have been the best example, in that nearly everyone who sees the film for the first time knows what will happen. The aspect of the unknown is somewhat removed. Still, the marriage between monster and mystery stands. 1. Is there a monster? 2. Who (or what) is the most important character/element? 3. How is the aspect of knowledge dealt with in the film? Are many questions left unresolved, or are characters more focused on “dealing” and working through knowledge they’ve already acquired? This entry was posted in Film, Movies. Bookmark the permalink. Not to quelch the argument, but what difference does it make? I think all such films can be categorized under the term “Suspense”; some sort of tension prevails that borders on fear. If there is no fearful tension, there is no Horror/Thriller category. And perhaps I ought to add it has to be serious fear. Maybe. It doesn’t really matter, not much does in terms of these discussions. Genres are fascinating for me though, as there is something about certain ones that attract a certain group. They don’t always know why, but they have a yearning to watch only horror or rom-coms whatever. Part of this is the expectation of events and scenarios. A horror film has a different plot construction than a suspence thriller, and viewers unconsciously realise this while watching. Films that excite play with these conventions by presenting these in new and interesting ways. Serious fear? I don’t know what you mean by this, I don’t think I’ve ever had a serious fear while watching a film. I mean fear that takes itself seriously. What? I still don’t understand really. Do you mean “real” fear, or a non-ironic almost comedic fear? I don’t mean anything. I don’t know why you listen to me. I don’t know why I do either, except that I enjoy it on some perverse level :p You make me think dammit! Psychological Thriller – goal is to scare the viewer, presenting a situation they could imagine themselves in. So for horror, monster movies and disaster movies are fair game. With psychological thrillers I think you are dealing more so with humans doing bad things. Horror you physically react (jump, cover eyes), psychological thriller you are scared through ideas and thoughts. That’s not bad at all, I think many still fall inbetween like Silence of the Lambs, I think it’s a very concise way of summing things up though. Well, I’m all for “serious fear” which I experience with certain films (ah, “The Shining” at 1 in the morning in an empty house!). 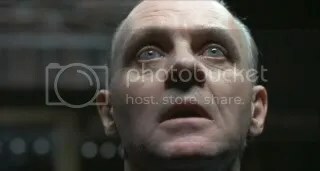 I’m going to argue that “Silence of the Lambs” is decisively over in the ‘horror’ branch, if only because its ‘psychological’/’procedural’ aspects are so (forgive me!) ridiculous. It’s Grand Guignol, and I’d never think of anything with GG qualities as fitting at all into the ‘suspense thriller’ genre. “Hannibal” is much more knowing about its guignol essence, and so, I feel, more at ease with itself. Too, “Psycho” is out to scare us, to make us experience the sublime through terror. Both horror and psychological thrillers can make us come to deal with uncanny and dark truths about the universe (as, I think, “Shadow of a Doubt” and “Frantic” do), but thrillers do this more through their treatment of character, of the epistemological and moral riddles involved, while horror deals in the absolute fear of death, or dissolution, or (in certain cases) the Fate Worse Than Death (including hell, possession, zombiefication, limbo et. al.!). Having your face removed or being eaten alive falls, I think, safely within this category! While your uncle being a psychopath and your ideals getting shattered is in the realm of the thriller. Beautifully said, and you’re point about the procedural element of The Silence of the Lambs being rather absurd is a great point. The way I see it, horror is a sub-genre of fantasy, therefore it only needs to obey the laws of the world it creates. Psychological thrillers, on the other hand, are more at the mercy of “real world” laws. It’s why I find if troubling when sci-fi and horror are bunched together in video stores, when in actuality, they’re very far from one another. It’s like calling Star Wars sci-fi, when there is no actual science involved, it’s fantasy, pure and simple. That’s a good point about fantasy and sci-fi. But, since I’ve been experiencing the perverse desire lately to start buying some of those paperbacks with the giant planets and exploding spaceships on the cover (ah, days of youth, are you fully fled?!?) I’d better smack myself down and ask– what do I care about science?! The so-called “soft scifi” (meaning, I understand, the stuff geared towards questions of social science) is surely more serious and of more worth than the “hard scifi” (which is, how do I build a photon-drive or something). Which is to say, I suppose, that “scifi” is an empty word that only resonates when the scifi work transcends itself by being about something besides mere “science”. In any event, Star Wars hardly makes one think of science, or even “the future”– though maybe the prequels, in their digitized way, are a bit more anchored in that sensibility. Well, that makes no discernible point! –What is this frame with the diffident youths in the yellow vehicle at the head of the page from? The girl in the Lakers (?) top looks like Melanie C, and stylistically it could be “Josie and the Pussycats” but I know that’s not true! I don’t care about science either, but I think it means working with some sort of logic or understanding, and the film explores in some way the ethics of said science. Films like Frankenstein or Blade Runner, explore the ethics of creating life. You’re right in that, a good science fiction has to use the scientific premise to explore a social issue, to be in any way relevant. The films I’ve mentioned are an example, others I’d throw into the mix would be The Day the Earth Stood still and nuclear war, or 2001 and whatever it’s trying to say about the human condition. Sci-fi is a genre I haven’t explored much, and there are many I need to revisit, so even pointing out bad examples proves impossible. It’s from Death Proof, I thought the feet were a dead give-away for Tarantino. Subliminally I thought Tarantino (color of Thurman’s jumpsuit) but, despite being haranged about it over the phone by friends, I still haven’t seen it nor even exactly “queued up” my imagination to see it! –Perhaps someone can create a post-“Matrix” dyspotia where my online wishlists come to life in the physical realm and choke me to death! . . .
I’ll let you know when that happens, preferably before the choking takes place. I like Death Proof quite a bit, though, I can’t say I can strongly recommend it. Personally, I’m not a huge Tarantino fan unless his protagonists are women… and there are a lot of women in this film. It’s certainly not the best he has to offer, but I thought it was fun enough.